ISLAMABAD, Pakistan (CNN) -- The Taliban claimed responsibility Thursday for a deadly suicide attack on a police building in Lahore, eastern Pakistan that killed at least 27 -- and vowed similar attacks in other cities. 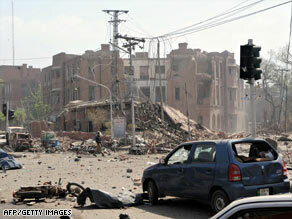 The scene of an apparent suicide car bomb attack on a police building in Lahore on May 27. Taliban Commander Hakimullah Mehsud said the Wednesday morning attack in Lahore was payback for the ongoing military offensive in the northwest part of the country that has become a haven for Islamic militants. "If the government continues to carry out activities at the behest of America, we will continue to hit government installations," Mehsud said. The Taliban think the military operation is meant to appease the United States, which has long asked Pakistan to battle insurgents operating from the stretch of tribal areas along the border with Afghanistan. The United States has said the militants have launched attacks on U.S-led coalition and NATO troops across the border. On Wednesday, another group, calling itself Tehrik-e-Taliban Punjab, claimed responsibility for the Lahore blast. Mehsud, who is second-in-command to Pakistani Taliban leader Baitullah Mehsud, dismissed that claim. "Tehrik-e-Taliban Pakistan is a single organization," Mehsud said. "There is not such group called Tehrik-e-Punjab. We are organized under the leadership of Baitullah Mehsud and we're against the U.S. and its allies." The Lahore attack, which involved gunmen and an explosives-laden van, also left more than 250 people wounded -- most of them police officers and staffers. Soon after the blast, police arrested three suspects, authorities said. Suspicion immediately fell on the beleaguered Islamic militants. Baitullah Mehsud had threatened to target major Pakistani cities if the operations did not cease. "The enemies of Pakistan are trying their very best to use every venue to destabilize the country," Interior Minister Rehman Malik told reporters Wednesday. "Please do not forget we're in a state of insurgency." The blast occurred on Mall Road near the city police headquarters and the high court. It is one of Lahore's busiest areas. The two sides exchanged gunfire, with the attackers hurling grenades, said Faisal Gulzar, deputy police superintendent. The van exploded before it could reach the building. It was carrying an estimated 100 kilograms (220 pounds) of explosives, Bhutta said. The targeted building -- Building 15 -- collapsed. It housed the city's rapid response team, which is dispatched during emergencies. Lahore is Pakistan's cultural capital, far removed from the fundamentalist interpretation of Islam that is embraced in the north of the country. Still, it has sporadically been swept into widening Islamist violence that grips the country. In March, gunmen hurled grenades and opened fire on officers at a police training center, killing at least seven cadets. The same month, gunmen opened fire on a bus carrying members of the Sri Lankan national cricket team on their way to a stadium for a match. The attack wounded at least eight members of the team and killed a driver and six Pakistani police officers. CNN's Reza Sayah and journalist Nazar Ul Islam contributed to this report.